Secure, cloud-based software solutions to digitise the investment process and management of alternative assets. We work closely with wealth managers, independent financial advisers and managers, to provide flexible integrated technology solutions, allowing you to move away from paper and spreadsheets, to a fully digitalised business. Direct portal access to invest and monitor your own portfolio of professionally managed alternative asset investments. A streamlined digital solution for financial advisory firms to allocate, manage and report on tax-efficient investments, all in one place. 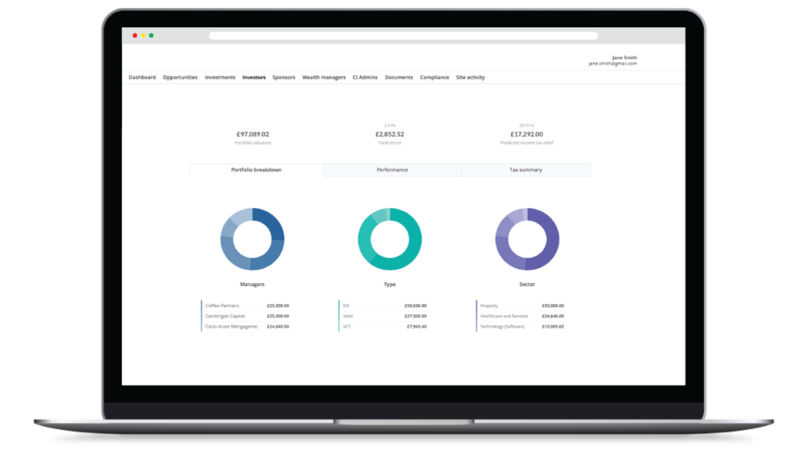 A secure white label solution to manage allocations and provide clients with access to portfolio valuations, statements and reports. A secure digital platform for nominated investors to review, transact and receive reporting on set opportunities.